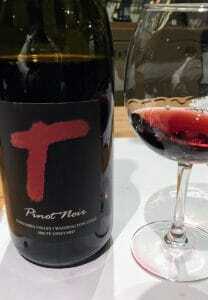 A few quick thoughts on the 2015 Tagaris Pinot noir from the Areté Vineyard. Founded in 1987 by Michael Taggares, the Tagaris winery honors the original Greek spelling of the family’s surname that was changed when Taggares’ grandfather, Pete, immigrated to the United States through Ellis Island. According to Paul Gregutt in Washington Wines, Tagaris became a “winery to watch” in Washington when Frank Roth joined the estate as winemaker in 2006. A former cellarmaster at Barnard Griffin, Roth also spent time in Canada working at Hawthorne Mountain and Sumac Ridge before returning to Washington. Over the years Tagaris has earned a reputation for focusing on small lots from unusual grape varieties in Washington like Tempranillo, Counoise, Mourvedre, Carmenere, Cinsault and Pinot noir from their three estate vineyards. The 200 acre Areté Vineyard was first planted in 1983 and is certified organic. Located at an elevation of 1300 feet on Radar Hill near Othello, the vineyard is a source of organically grown fruit for Power’s Badger Mountain and Chateau Ste. Michelle’s Snoqualmie Naked wines. The vineyard include 2.27 acres of Pinot noir planted on sandy loam. Frank Roth’s winemaking style is noted for his restrained use of oak, preferring to use neutral oak barrels that are at least six years of age. Medium intensity nose. Some red cherry notes with a little herbal tomato leaf. With some air a bit of fresh cranberry comes out as well. This Pinot has fresh cranberry notes. On the palate those red fruits come through with the herbal notes more muted. There is also a spice element on the palate that is not very defined. Medium-plus acidity with medium tannins and a very light body that makes the fruit taste a bit thin. Perhaps this could have used a little new oak to balance? 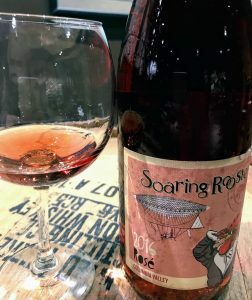 At around $30-35, you are paying for the novelty and uniqueness of a Washington Pinot noir. Admittedly, if you compare this to the quality level you can get from an equivalent priced Oregon or California Pinot, it doesn’t hold well. Tagged Areté Vineyard, Badger Mountain, Barnard Griffin, California wine, Carménère, Chateau Ste. Michelle, Cinsault, Counoise, Frank Roth, Hawthorne Mountain, Michael Taggares, Mourvèdre, Oregon wine, Organic viticulture, Paul Gregutt, Pinot noir, Powers Winery, Radar Hill, Snoqualmie, Sumac Ridge, Tagaris, Tempranillo, Washington Wines and Wineries.